$10.00 plain ppd. $12.00 fancy ppd. The fishing kit contains five hand made hooks without eyes. 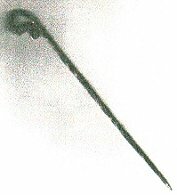 The end of the shank has been flared out as was done throughout the 18th century. One drilled bottle cork for a bobber, 20 feet of waxed linen thread, four split shot sinkers and tying instructions. All this in a small round tin. $1.50 plain ppd. $2.00 fancy ppd. Plain hooks are made with round wire. To make the fancy hooks, I take the same round wire and hammer out four flats down the side. After the hook is made, I give it a fancy twist. I also make a very nice vent pick from the same wire that I use for the fish hooks. I designed this pick after hearing many complaints about the other picks on the market being to large and to brittle. The wire is hammered square and shaped into what is called a shepherds crook. Then a fancy twist is added. These picks are strong but not brittle and will fit most all of the custom touch hole liners being used with todays flintlocks.